A guaranteed best seller every time, Transatlantic Sessions starts its annual perambulation around the U.K. each year as a fixture in the Celtic Connections programme. The formula is simple enough; a, more or less, constant group of musicians, most from over here but a few from over there, joined by a handful of guests, different each year, with a slight bias towards acts from over there. This year’s impressive guest line-up was Tim O’Brien, Gretchen Peters, Molly Tuttle, Cara Dillon and Paul McKenna. This was the first night and, whilst not everything fell into place straight away, expectations were definitely met in the end. The first couple of guests, Scotland’s Paul McKenna and U.S bluegrass starlet Molly Tuttle. Paul said that as a Glaswegian he had always wanted to play on the Royal Concert Hall stage. His material was strong though, including, Banks of the Moy about the imprisonment of Michael Davitt, founder of the Irish Land League which organized resistance to absentee landlordism, ‘far from the lovely sweet banks of the Moy’. Paul got into his stride in the second half with his own very fine song The Dreamer, which he wrote whilst living in the United States about the extent to which the 1960s civil rights dream was unfulfilled given persistent discrimination and police killings. Molly Tuttle has won lots of awards although she’s only 25. Save This Heart (from her EP Rise) gave her a chance to show us her exceptional claw hammer guitar technique. She played two songs from her forthcoming debut album When You’re Ready due to be released in April – Take The Journey in her second half slot was her strongest contribution on the night but we were left with the sense that we hadn’t seen what she is really capable of. The ‘house band’ features an extraordinary array of talent: Aly Bain, Jerry Douglas (also master of ceremonies), Russ Barenberg, Phil Cunningham, John Doyle, Mike McGoldrick, John McCusker, Donald Shaw, James Mackintosh and Daniel Kimbro – who was very ably subbing on double bass for Danny Thompson, who sadly isn’t well enough to join the band this year and, as fine a player as Daniel is, you can’t help but miss Danny’s towering presence. The first half really got going when Doyle, McCusker and McGoldrick played a set of tunes from their Wishing Tree album from last year. Played with their trademark verve and passion, the set was enhanced by the rest of the house band all locking into gear behind the trio. The audience response to this, and to other instrumentals, was if anything more enthusiastic than for most of the guest singers – which does not say the singers were not appreciated, only that this is an audience that has a strong liking for Scottish and Irish traditional tunes when played as well as this. John Doyle also did a single guest slot, giving us a fine rendition of his own song Burke & Hare, also from The Wishing Tree, telling the tale of the infamous murderers’ activities in Edinburgh in 1828, and using a nursery rhyme about the murders for the chorus. Tim O’Brien was making a welcome return to the house band as well doing a guest slot. He instantly had a warm, authoritative presence in front of the mike, singing and playing, mostly mandolin, with relaxed confidence. He sang two of his own compositions from his most recent album, the later the title track. Guardian Angel he introduced quite cheerily as the night’s first tearjerker and then told us it was about the death of his older sister when he was nearly two years old. Where The River Meets The Road (the album’s title track) he said was about his Irish great grandfather’s journey to his hometown of Wheeling in West Virginia once he arrived in the U.S. Tim’s songs are always top notch and he sings with an effortless conviction that completely draws you in. He also played one instrumental titled Keith In A Palm Tree which, he explained, he wrote after Keith Richards fell out of a palm tree in Fiji in 2006 sustaining a serious head injury. A cheerful, fun tune, it included, half-way through, a thud representing Keith’s head meeting the ground! More Tim O’Brien would have been great but the format limits guest’s contributions and in no time it’s time to move on. The final guest from across the Atlantic was Gretchen Peters. Another superb songwriter and assured performer, she sang Wichita, a hard-hitting song about sexual abuse, co-written with British singer/song-writer Ben Glover, from her recent album Dancing With the Beast (read Glenn Kimpton’s review here). Black Ribbons imagines the devastating impact of the Deepwater Horizon oil spill in the Gulf of Mexico in 2010 on one family in Louisiana. On A Bus From St Cloud brilliantly describes the narrator’s experience of imagining seeing someone you are estranged from and miss, even when your feelings about them are ambivalent, in different, random places. A captivating performance from Gretchen. Cara Dillon was in great form, she seemed relaxed and sang as resolutely as the big accompaniment required. Continuing a pattern established by others, she sang two songs from her recent album Wanderer – Sailor Boy, a traditional song about death at sea, had Tim O’Brien subbing for the vocal that Kris Drever adds to the album track, and Banks of the Foyle which a reduced size band gave an appropriately uncluttered backing to. P For Paddy is a great sing-along song that Cara sang with real zest (she covered it on her great 2009 album Hill of Thieves). Aly Bain led off another great set of tunes, including a tune from his native Shetland and a John McCusker tune. An outstanding moment in the evening came with an air written by Phil Cunningham for the mighty uilleann piper Liam O’Flynn who died last year. Phil explained in introducing it that he wrote the song for Liam some time before he died, so Liam had heard it, and Phil told Liam that his playing with Planxty had been the inspiration for Phil to play traditional music. The tune didn’t have a title until the set list was being put together in rehearsals for the show when it became So Long Liam – a beautiful, dignified tune featuring exquisite accordion from Phil and lovely, respectful pipes from Mike McGoldrick. At the heart of the Transatlantic Sessions is an utterly reliable engine room that is on top of everything – tunes, key and time signature changes – always keeping things on track. 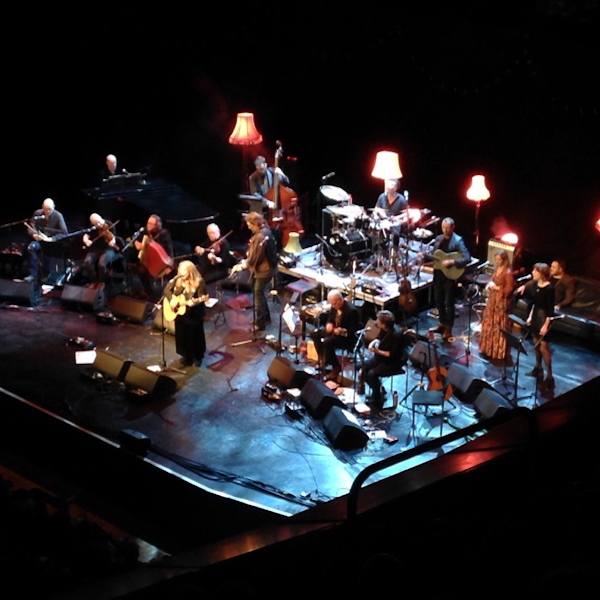 All in all a hugely entertaining evening from the large cast of characters that have assembled for this year’s Transatlantic Sessions. Visit the Folk Radio UK website to read this article in its entirety.